Clinical indexes of insulin resistance (IR) have acquired increasing importance with the development of various treatments that improve endogenous insulin action. In the prospective analysis of a cohort of – 36,000 adults followed for 4 years, Hodge et. al found that higher-carbohydrate diets were associated with a lower risk of development of type 2 diabetes. However, the type of carbohydrate was equally important: low-GI carbohydrates reduced the risk, while high-GI carbohydrates increased the risk. Thus, low GI and low GL are not equivalent and produce different clinical outcomes. Because this issue may be confusing to some readers, it is important to clarify the difference between GI and GL. Both the quality and quantity of carbohydrate determines an individual’s glycemic response to a food or meal. By definition, the GI compares equal quantities of available carbohydrate in foods and provides a measure of carbohydrate quality. Available carbohydrate can be calculated by summing the quantity of available sugars, starch, oligosaccharides, and maltodextrins. 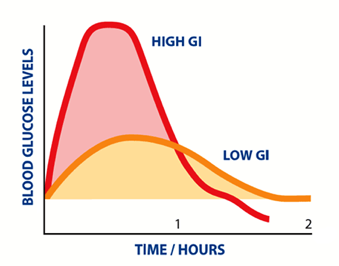 As defined, the GL is the product of a food’s GI and its total available carbohydrate content: glycemic load = [GI x carbohydrate (g)]/100. Therefore, the GL provides a summary measure of the relative glycemic impact of a “typical” serving of the food. Foods with a GL ≤10 have been classified as low GL, and those with a value ≥20 as high GL. In healthy individuals, stepwise increases in GL have been shown to predict stepwise elevations in postprandial blood glucose and/or insulin levels. It can be seen from the equation that either a low-GI/high-carbohydrate food or a high-GI/low-carbohydrate food can have the same GL. However, while the effects on postprandial glycemia may be similar, there is evidence that the two approaches will have very different metabolic effects, including differences in β-cell function, triglyceride concentrations, free fatty acid levels, and effects on satiety1. Because the glycemic response varies substantially between different foods and because this variability is not explainable by glucose chain length3, 4, the concept of glycemic index was developed to quantify the glycemic responses induced by carbohydrates in different foods. In prospective cohort studies, higher glycemic index and load predicted an increased risk of diabetes in the study5. Although the exact mechanisms by which high-glycemic index diets may alter the risk of type 2 diabetes are unclear, 2 major pathways have been proposed. First, the same amount of carbohydrates from high-glycemic-index foods, by definition, produce higher blood glucose concentrations and a greater insulin demand than do low-glycemic index foods. It is possible that chronically increased insulin demand results in pancreatic exhaustion that can result in glucose intolerance. Second, high-glycemic-index diets may directly increase insulin resistance. In animal studies, diets high in amylopectin or glucose produced more rapid and severe insulin resistance than did amylose-based diets. Insoluble fiber but not soluble fiber, was found to be inversely associated with diabetes risk in previous cohort studies5. 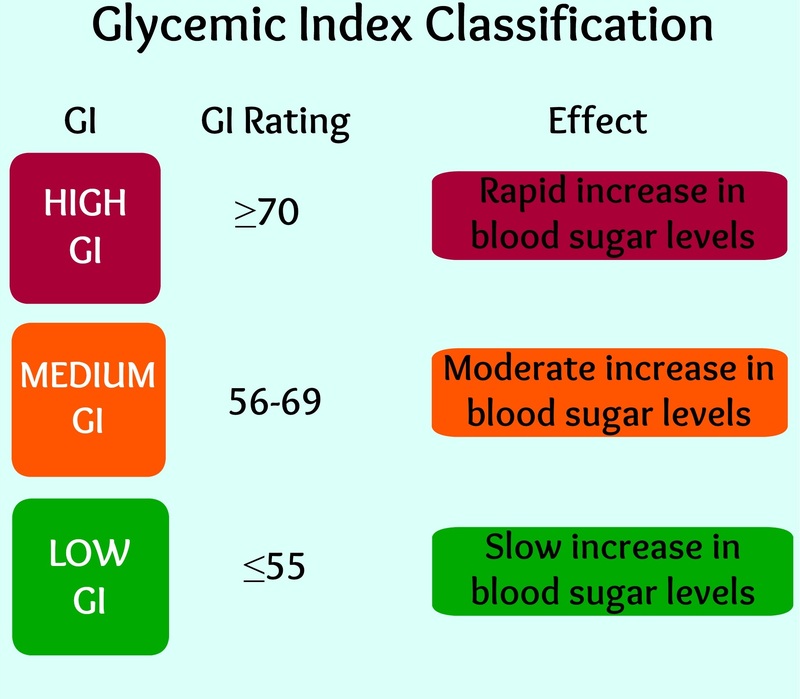 Barclay A W; Glycemic Index, Glycemic Load, and Glycemic Response Are Not the Same, 2005 by the American Diabetes Association. 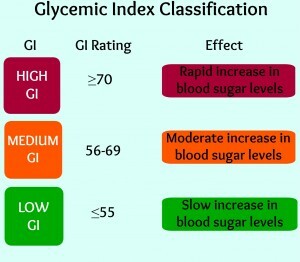 ATKINSON FS; International Tables of Glycemic Index and Glycemic Load Values: 2008, DIABETES CARE, VOLUME 31, NUMBER 12, DECEMBER 2008. Wei M, Gibbons LW, Mitchell TL, Kampert JB, Blair SN. Alcohol intake and incidence of type 2 diabetes in men. Diabetes Care 2000; 23: 18–22. Wannamethee SG, Shaper AG, Perry IJ, Alberti KG. Alcohol consumption and the incidence of type II diabetes. J Epidemiol Community Health 2002; 56:542–8.